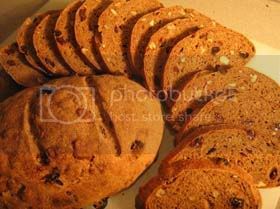 I make this bread for the sole purpose of toasting (just until it browns a bit around the raisins) and then spreading with a thin slice of butter. I use an overnight starter for this bread. Other terms for this are poolish (French), biga (Italian), or sponge. Don't let the terms or the process turn you away. They are all just a mixture of flour, water, and yeast left to bubble in a corner of the kitchen for a day or two. 1 Stir together the dry ingredients. Add the water and mix gently to create a wet dough. Cover with plastic wrap and a clean kitchen towel. Let sit in an undisturbed area of your kitchen overnight or no longer than 12 hours. Note: Use room temperature water, not hot water. You want to discourage fast growth. Slow fermentation permits growth of wild yeast and bacteria that lend a distinct tanginess to the final product. Filtered water is preferred to tap water which, depending on where you live, may contain small amounts of chlorine or other chemicals that retard growth. The rye flour in this recipe adds sourness. I like a hearty, sour, non-sweet bread. It makes the raisins and the sweetness of the pecans stand out. If you don't have rye flour, or you like a loaf with a little less tang, you may replace the rye flour with whole wheat flour. 1 Add the water to the flour to create a paste. Combine this paste with your overnight starter and stir gently but completely. Cover with plastic wrap and a clean kitchen towel. Let sit in an undisturbed area of your kitchen no longer than 12 hours. Note: Here you're just feeding your starter. 1 Add the water to the flour to create a paste. Combine this paste with your starter and stir gently but completely. Cover with plastic wrap and a clean kitchen towel. Let sit in an undisturbed area of your kitchen overnight or no longer than 12 hours. 1 Stir together flours, salt, yeast, and ascorbic acid if using. 2 Dissolve honey and molasses in water. (I warm the water in the microwave for 20 seconds to assist in dissolving.) Stir in oil. 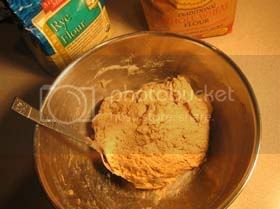 Add starter to flour, hand mix a few times, then add liquid ingredients. Hand-mix until there is no more dry flour in the bowl (1 to 2 minutes). Cover with plastic wrap and a kitchen towel and let sit (autolyse) in an undisturbed area of your kitchen for 30 minutes. 3 Combine cinnamon, nutmeg, and ginger in a small bowl. Chop pecans. 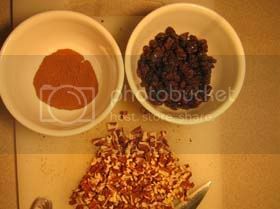 4 Sprinkle flour onto a work surface. 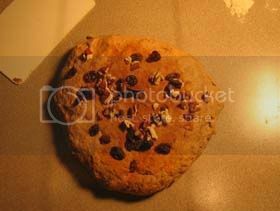 Place dough onto work surface and sprinkle lightly with flour. Knead approximately 5 minutes, sprinkling spice mixture, raisins, and nuts over the dough and folding them in as you knead. Place dough into a clean bowl, cover with plastic wrap and a kitchen towel, and let rise in an undisturbed area of your kitchen for 2 hours (less if the temperature of the room is greater than 75°F). Note: All-purpose flour works best for handling dough. 5 Gently deflate dough and scoop out onto a flour-dusted surface. 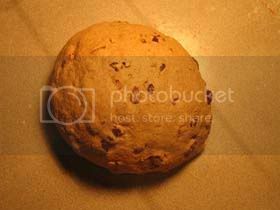 Slice dough into two equal pieces. Knead each piece about 10-15 times to reestablish a ball. Cover balls, and let rise for another hour. Note: It's best to keep the dough moist for its second rise, so unless you own a proofing box you'll be at the mercy of plastic wrap ... that is, until you employ the trashcan liner trick. Place loaves onto a parchment-lined cookie sheet. 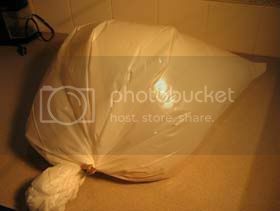 Slide sheet into a clean, unused trash can liner. (I use a "tall kitchen bag" or 13 gallon size.) Prop up with a bottle. Billow the bag to fill it with air, and clamp shut with a clothes pin. 6 Place baking stone or tiles onto bottom shelf of oven (If you'll be using the steaming tip described below, place stone onto a middle shelf to allow room for a pan of water on the bottom.) and preheat to 490°F for at least one hour. 7 Remove loaves from bag. Gently deflate and shape into final form. (To make the elongated loaf as shown, I just roll the balls on the counter until they are about 6 inches long by 3 inches wide.) 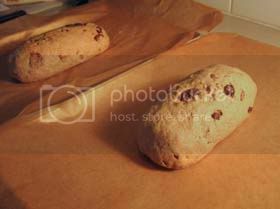 Place the shaped loaves onto parchment-lines cookie sheets and allow to rise uncovered for another hour. 8 Cut away parchment under one of the loaves, leaving about an inch of paper around the dough. Place the loaf with parchment onto a peel or paddle. Using a razor blade, lame, or very sharp knife, make three slashes about ¼ inch deep into the top of the dough. Using a spray bottle, mist the loaf with clean water. Slide the loaf onto the preheated stone. Reduce the oven temperature to 450°F. Bake for 20 to 24 minutes until the outside is very dark or until the loaf gives off a hollow-sounding "thud" when tapped. Remove from the oven with a peel. Cool on a rack or other non-solid surface. Repeat for second loaf. Note: Don't forget to bring the oven back up to 490°F. before baking the second loaf. Likewise, don't forget to reduce the oven temperature to 450°F as soon as you place the loaf in the oven. Another technique that helps to mimic commercial bread ovens is to place a pan of boiling water in the bottom of the oven, underneath the baking stone, for the first 5 minutes of baking. I use a small cast iron pan for this. Just remember to remove the pan after 5 minutes or your loaf won't brown properly. If your oven has hot spots (mine does), turn the loaf halfway through baking.